TORONTO, March 1, 2017 /CNW/ - Treasury Metals Inc. (TSX: TML) ("Treasury" or the "Company") is pleased to announce a corporate update and project development strategy to further advance the Company's Goliath Gold Project located in Northwestern Ontario. The Company aims to be in a position to make a construction decision during the third quarter of 2018 pending the successful recommendation of a Feasibility Study to be completed at the Goliath Gold Project. Chris Stewart, President and Chief Executive Officer, commented: "We have completed a comprehensive development review and I am pleased to announce that we have created a strategic 18-month plan to advance the Goliath Gold Project towards a construction decision in mid-2018. Concurrently, our permitting has advanced on schedule with the recent federal Information Request submission being an important milestone in this process. We are also excited about the potential to further expand the underground mineral resource area at Goliath, and will be initiating a significant underground infill and expansion drilling program later this year to delineate this potential. Finally, the updated PEA will allow us to communicate the considerable progress made at Goliath in recent years." "We have a lot of work ahead of us to accomplish these goals, but are confident in our team's ability to meet them. Building strong partnerships with the local community and Aboriginal groups, along with various governmental agencies, will be of paramount importance to us achieving our objectives. We look forward to the opportunity to develop the Goliath Gold Project and transition Treasury into a responsible junior gold producer that will invest and create many jobs in the local communities of Northwestern Ontario." The current planned drill program and targets are outlined in Figure A. 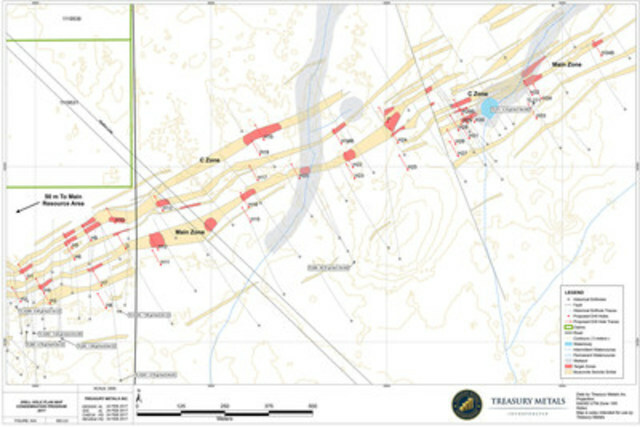 Following an in-depth review of the H2-2016 infill drill program by Treasury and P&E Mining Consultants Inc. ("P&E"), a Phase II program consisting of 30,000 metres of underground infill drilling has been designed. This program will involve drilling an additional 40 to 50 holes allowing for further resource conversion from inferred to the indicated category and potential expansion of known gold mineralization into areas where gold mineralization was previously unknown. The Company, along with assistance and direction from AMEC Foster Wheeler ("AMEC"), has submitted a draft of the responses to CEAA for review prior to a formal submission of Information Request responses as part of the Federal Government of Canada's Environmental Assessment process ("Federal EA"). The Company expects the Federal EA should be completed with a formal decision towards the end of 2018. This timeline includes the anticipated time for the Company to develop and submit responses to requests from the Federal EA process as well as the allotted time for the Government's review.